Fall is here and now it’s time to do those wonderful chores cleaning up after the trees lose all their leaves. Best ways to clean up leaves is rake them up in piles and burn them. If you have achy shoulders like I do and can not use a garden rake, then get out the lawnmower. You can chop up the leaves and it cleans about 85% of the mess up. I always rake out the corners where the mower can not get to when mowing them up. Some gardeners use leaves to put over fragile garden plants such as perennials and other flowering plants. The leaves when spread out underneath the trees provides a layer of protection from harsh winter weather. It keeps the roots from freezing. Below is an image of the leaves when they are mowed up. 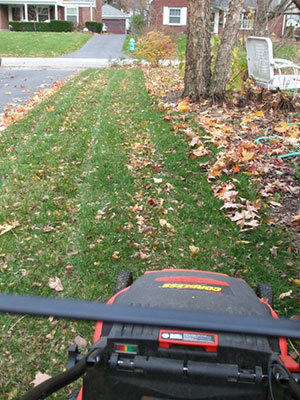 If you have a bagger then great, catch all the leaves in your bagger and then grass will look clean and fresh.